Devices such as media players, WiFi nodes, cameras and servers can all be monitored from a single graphical interface, providing immediate warning on loss of commumication or thresholds reached. Net Dream Systems designs and installs Camera Security and Access Control Systems. We can Internet enable your existing cameras, allowing authorised access to your camera system via Web browser, iPad ,TV displays and alike, be it on board or remotely. A new installation will allow for IP enabled cameras, allowing for a simplified installation using a single Cat5e cable to carry video/audio and power to the camera. There are some fringe benefits to be gained in this approach, an example being the Uninterupted Power Supply protecting your network switch also protects your cameras. The storage of camera content also simplifies, as this storage is Network based (NAS) and like any other storage drive, provides for authorised access to content. The same network storage can be used for storing movies, reducing the number of devices needed to perform these previously independent functions. Designing from ground up or retrofitting the existing infrastructure we deliver a fully integrated system. Room control systems allow for the control of many different services, from many different interfaces but all with the same look and feel. Control of your audiovisual. 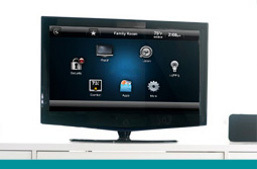 lighting, security and comfort systems can be from a remote control, Web browser, iPad/iPod, TV display or Touchpanel. When you go to Movies on your TV display or handheld device you will be presented with a graphical presentation of your entire Movie library. You can drill down via genre, actor, year and more and once you decide which movie you want to play the room will set itself apporopriately, turning on the TV display, setting the correct input, dimming the lights or any other relevant variables and start playing the movie. Each component within the design continues to operate in an independent manner, so you can continue to control your satellite receiver by it’s normal remote control if required.